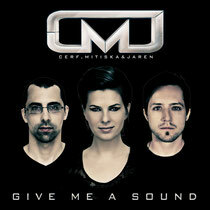 As one of EDM’s most promising trios, Cerf, Mitiska & Jaren form a league of musicians that joined forces in 2006. Producers Matt Cerf and Shawn Mitiska and singer/songwriter Jaren Cerf have been making waves since bursting onto the dance scene with their first hit ‘Light The Skies’. The mix of emotional prog-trance, strong vocals, striking lyrics and powerful beats turned out to be the formula to success, resulting in club hits such as ‘Saved Again’, ‘You Never Said’, ‘Man On The Run’, ‘Beggin’ You’ and more. After more than six years of collaborating, their debut album will finally land. Featuring high class collaborations with the likes of Dash Berlin, Pulser, Rank 1, Audien, Chris Jones, Fine Taste and many more, the 13 tracks of the CM&J album each shine their own light. From guitar-driven pieces like ‘Our Neighborhood’ to the heartfelt beat-ballad ‘Part of Me’ and contagious, housy ‘Ready For Go’, ‘Give Me A Sound’ crosses much of the spectrum of electronic dance music.